St. Jean Vianney Parish was founded on November 10, 1975, with about 400 families and with Father Eugene Engels serving as the first pastor. With money borrowed from the Diocese, the parish purchased 17.5 acres of wooded property on S. Harrell’s Ferry Road for $106,000, and rented a small green house located nearby to serve as the temporary rectory and office. For two years the weekend Masses were celebrated just down the road at the Elk’s Lodge (now a part of Runnel’s School). The first building to be constructed on the church property was a pre-fab house to serve as rectory, daily Mass chapel, and parish office. It was completed in August 1976 at a cost of $31,000, and continues to serve the community as the parochial school office. Next came the Parish Life Center, a multipurpose facility designed to be used as both a church and parish hall. It was built for $306,000 and the first Mass in the new building was celebrated on Thanksgiving Day, November 24, 1977. The Parish Life Center was to be the center of worship for the community for the next 21 years until the completion of the permanent church, after which time it was rededicated as Father Engels Hall. The third phase of construction involved a new office/religious education building to allow for onsite religious instruction and the separation of the priests’ residence from the parish office. It was blessed on Thanksgiving Day, November 22, 1979, and completed at a cost of $123,000. This complex now serves as home for the Learning and Growth Center, our parish preschool which began as a Mother’s Day Out Program in the late seventies, and which has evolved into an excellent center of early childhood development. Two years later a small parish hall was constructed for about $83,000 and given the name Curé d’Ars Hall in honor of the parish patron saint. This hall now serves as the school library. Discussions regarding the educational mission of the Church eventually led to the establishment of a parish elementary school in 1985. The construction of the classroom building as well as a new rectory for the priests were both undertaken at the same time and completed in time for the start of classes in August of 1985. The school began with one section each of grades K through 4, and an approximate enrollment of 100 students. The cost of the new rectory with landscaping and furnishings was about $235,000, and the cost of the first two-story wing of the school about $425,000. In February 1989, Father Donald Blanchard was appointed the second pastor of St. Jean Vianney, succeeding Father Engels who became the chaplain at Louisiana State Penitentiary at Angola. The steady growth of the parish and the accompanying increased enrollment at the school led to the construction of a second two-story classroom wing in 1992 at a cost of $441,000. The school now comprises two sections each of grades K through 8, with a total enrollment of 535 students. In addition, the growing needs of the community led to the conversion of the new rectory into the parish office building in 1993. Discussions also began in earnest around this time regarding the development of plans for a permanent church for the parish. Fund raising began at the end of 1993, leading to the eventual ground breaking on October 6, 1996. After two years of construction, the new church was dedicated by Bishop Alfred Hughes on November 28, 1998. The cost of the church was $2.9 million, with an additional $900,000 spent on related furnishings, fees, pipe organ expansion, parking lot expansion, and landscaping. The church has received numerous awards for its boldness and simplicity of design, as well as for the beauty of its many works of bronze sculpture designed by California artist Max DeMoss. In June 2001, Fr. Matt Lorrain was appointed the third pastor of St. Jean Vianney succeeding Father Blanchard who became pastor of Sacred Heart Church. During his short term he was able to foster the development of our Art and Environment Committee to enhance our Liturgies, as well as improving and expanding our pipe organ to a full 29 ranks. He was instrumental in the growth of Small Christian Communities. He completed the construction of the parking lot expansions and driveways, enhancing the overall beauty and accessibility of our property. In July 2005, Father Tom Ranzino began his tenure as St. Jean Vianney’s fourth and current pastor when Fr. Lorrain was appointed as Vocations Director for the Diocese of Baton Rouge. Fr. Tom continues to build on the good work began by Fathers Engels, Blanchard and Lorrain, as well as the contributions provided by those who have served the parish as associate pastors: Fathers Dan Lemoine, Bob Stine, David Allen, Randy Cuevas, Louis Oubre, Duane Breaux, Ray Shore, Stephen Hymel, Keun-Soo Lee, Matt Dupre, Tony Russo, Alec Sheldon, and Joey Angeles. Permanent Deacons who have served here include Gene Waguespack, Jacques Bernard, Tom Robinson, Tommy St. Pierre and currently Brent Duplessis and Dan Borne'. Religious sisters who have served in the parish are Sr. Maria Rabalais, C.S.J. and Sr. Dianne Heinrich, C.D.P. 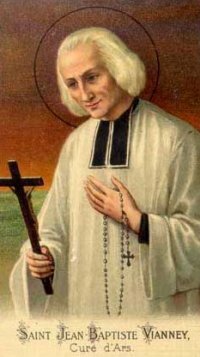 We, the Body of Christ, in the parish of St. Jean Vianney, reaffirm our relationship with God and with each other as members of that Body. We accept the charge of our Lord and Brother to be “the leaven in the mass” (Mt. 13:33) and “the light of the world” (Mt. 5:14). In that role we pledge ourselves, in union with the leadership of the Church, to use our personal and collective resources to enable all whose lives we touch, to realize their full potential in the Kingdom of God. Thus, we recognize that each of us is called to ministry: to proclaim the Gospel of Jesus Christ; to enrich our relationship with God through the Eucharist and the other Sacraments, prayer, Scripture reading, and continuing education; to strengthen the family unit as the foundation of the Faith Community; to reach out in love and service to those around us by proclaiming faith through words and deeds. We will seek to share this spirit with those we meet, whether they are actively seeking faith, have fallen away from Christ and His Church, or have never known His love. We ask the Holy Spirit to make us sensitive in discerning needs, strong in the resolve to meet them, and wise in choosing the means. In 1806, the curé at Ecully, M. Balley, opened a school for ecclesiastical students, and Jean-Marie was sent to him. Though he was of average intelligence and his masters never seem to have doubted his vocation, hisknowledge was extremely limited, being confined to a little arithmetic, history, and geography, and he found learning, especially the study of Latin, excessively difficult. One of his fellow-students, Matthias Loras, afterwards first Bishop of Dubuque, assisted him with his Latin lessons. But now another obstacle presented itself. Young Vianney was drawn in the conscription, the war with Spain and the urgent need of recruits having caused Napoleon to withdraw the exemption enjoyed by the ecclesiasticalstudents in the diocese of his uncle, Cardinal Fesch. Matthieu Vianney tried unsuccessfully to procure a substitute, so his son was obliged to go. His regiment soon received marching orders. The morning of departure,Jean-Baptiste went to church to pray, and on his return to the barracks found that his comrades had already left. He was threatened with arrest, but the recruiting captain believed his story and sent him after the troops. At nightfall he met a young man who volunteered to guide him to his fellow-soldiers, but led him to Noes, where some deserters had gathered. The mayor persuaded him to remain there, under an assumed name, as schoolmaster. After fourteen months, he was able to communicate with his family. His father was vexed to knowthat he was a deserter and ordered him to surrender but the matter was settled by his younger brother offeringto serve in his stead and being accepted. Jean-Baptiste now resumed his studies at Ecully. In 1812, he was sent to the seminary at Verrieres; he was so deficient in Latin as to be obliged to follow the philosophy course in French. He failed to pass the examinations for entrance to the seminary proper, but on re-examination three months later succeeded. On 13 August, 1815, he was ordained priest by Mgr. Simon, Bishop of Grenoble. His difficulties in making the preparatory studies seem to have been due to a lack of mental suppleness in dealing with theory as distinct from practice — a lack accounted for by the meagreness of his early schooling, the advanced age at which he began to study, the fact that he was not of more than average intelligence, and that he was far advanced in spiritual science and in the practice of virtue long before he came to study it in the abstract. He was sent to Ecully as assistant to M. Balley, who had first recognized and encouraged his vocation, who urged him to persevere when the obstacles in his way seemed insurmountable, who interceded with the examiners when he failed to pass for the higher seminary, and who was his model as well as his preceptor and patron. In 1818, after the death of M. Balley, M. Vianney was made parish priest of Ars, a village not very far from Lyons. It was in the exercise of the functions of theparish priest in this remote French hamlet that as the "curé d'Ars" he became known throughout France and theChristian world. A few years after he went to Ars, he founded a sort of orphanage for destitute girls. It was called "The Providence" and was the model of similar institutions established later all over France. M. Vianney himself instructed the children of "The Providence" in the catechism, and these catechetical instructions came to be so popular that at last they were given every day in the church to large crowds. "The Providence" was the favourite work of the "curé d'Ars", but, although it was successful, it was closed in 1847, because the holy curé thought that he was not justified in maintaining it in the face of the opposition of many good people. Its closing was a very heavy trial to him. But the chief labour of the Curé d'Ars was the direction of souls. He had not been long at Ars when people began coming to him from other parishes, then from distant places, then from all parts of France, and finally from other countries. As early as 1835, his bishop forbade him to attend the annual retreats of the diocesan clergy because of "the souls awaiting him yonder". During the last ten years of his life, he spent from sixteen to eighteen hours a day in the confessional. His advice was sought by bishops, priests, religious, young men and women in doubtas to their vocation, sinners, persons in all sorts of difficulties and the sick. In 1855, the number of pilgrims had reached twenty thousand a year. The most distinguished persons visited Ars for the purpose of seeing the holycuré and hearing his daily instruction. The Venerable Father Colin was ordained deacon at the same time, and was his life-long friend, while Mother Marie de la Providence founded the Helpers of the Holy Souls on his advice and with his constant encouragement. His direction was characterized by common sense, remarkable insight, and supernatural knowledge. He would sometimes divine sins withheld in an imperfect confession. His instructions were simple in language, full of imagery drawn from daily life and country scenes, but breathing faithand that love of God which was his life principle and which he infused into his audience as much by his manner and appearance as by his words, for, at the last, his voice was almost inaudible.